Yesterday Greg and I attended a retirement luncheon for one of Greg’s former coworkers, Joyce. It was nice to see some old friends, and to meet some new people, but the pleasantries were tempered by circumstance. The honoree’s husband was unable to attend because he had been hospitalized the evening before. Needless to say, the honoree was a bit distracted with worry, but she talked to her husband on the phone just before the festivities began and he was in very good spirits. And, of course, she was going to head to the hospital as soon as the retirement festivities were over. Joyce is a lovely person. If I had to describe her with just one word, it would be good-hearted. She is loving and kind and thoughtful, and she doesn’t have a mean bone in her body. She is also a very talented artist and crafter. Every year she made ornaments for all the guests at the department’s holiday luncheon. 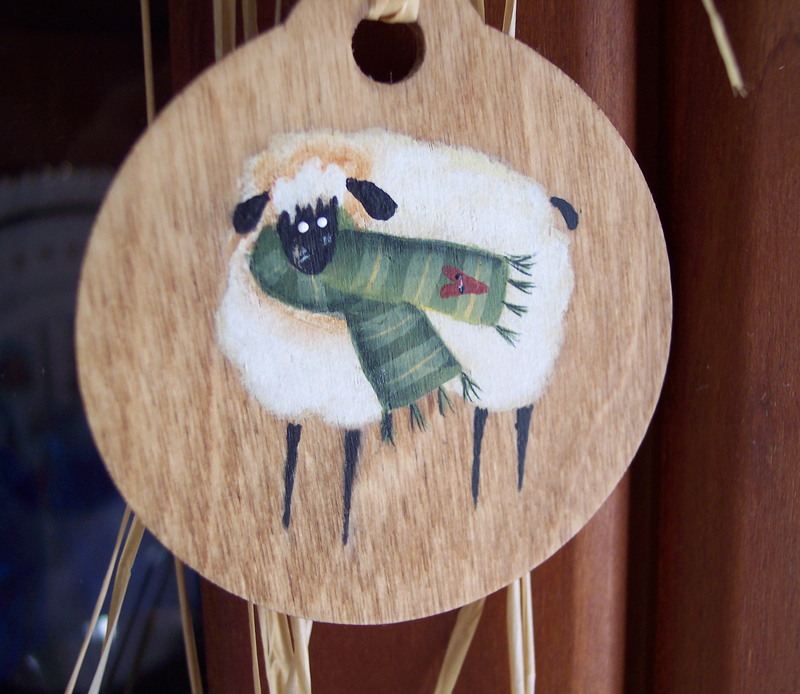 Here’s a picture of an ornament she made one year that I keep out on display year round. What knitter wouldn’t love a cute lamb wearing a wool scarf? 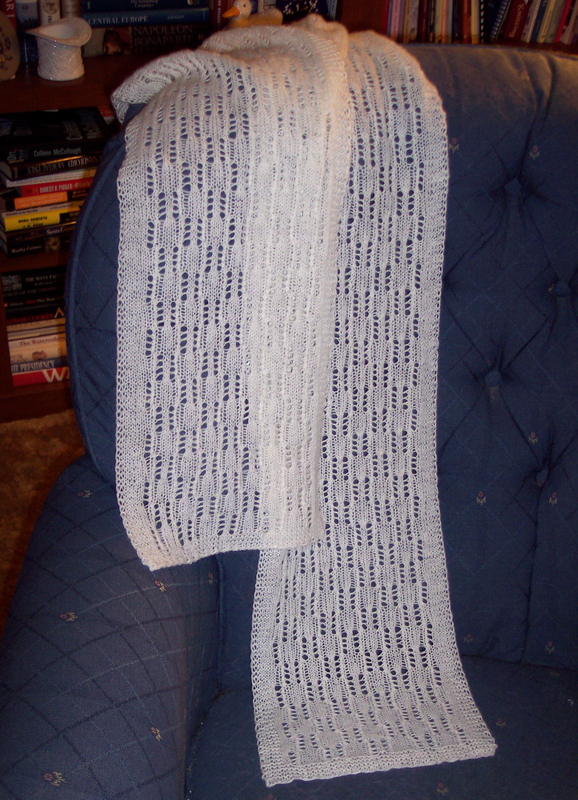 I knitted Joyce the lace scarf pictured at the top of the post as a retirement gift. There was some Jamieson’s Lace Ultra in my stash, a blend of Shetland wool and lambswool, that I purchased from Judy Alexander at TheKnitter.com. I had three balls, just enough for a nice lace scarf, and I chose a pattern–Checkered Acre–that is both a traditional Shetland pattern and one that looks the same when view right-side up and up-side down so that I could knit from end to end without grafting or doing a provisional cast-on. I like Jamieson’s Lace Ultra a lot. It is 2-ply and loosely twisted, which makes it a wee bit splitty, but not annoyingly so. It has the spring and body one expects in a Shetland wool, and the lambswool adds an unexpected softness. When knitted and washed, the yarn blooms nicely and develops a subtle halo that I just love. This yarn is very similar to Jamieson and Smith’s 2-ply Shetland Supreme and comes in a nice array of colors, although Judy stocks only the natural. I don’t know whether she would be able to special order other colors. I hope that Joyce enjoys her scarf as much as I enjoy her ornaments. And I hope she enjoys her retirement as much as Greg and I are enjoying ours. Here’s to Joyce! I wish her and her husband many more happy years together. They deserve it.